Basketball Hall-of-Famer Dikembe Mutombo turns 50 today. The NBA's second all-time leading shot blocker obviously meant a lot to defenses. 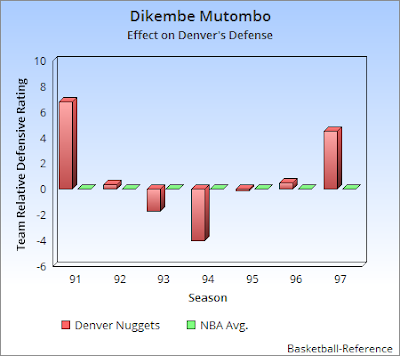 This chart shows the Nuggets team defensive rating for each year he was in Denver and the season before and after they had Mutombo. Negative numbers mean they were tough to score on while positive numbers mean they allowed more points than league average. You can see the Nuggets were an average or better defense all five years with Mutombo (1992-'96). The dramatic high rise bars show up the season before they drafted their star center and the year after he left for Atlanta. On average, Denver's opponents scored 6 points fewer per 100 possessions when Dikembe was on the team compared to the two years without the big fella.